The end of the School year here in Laos and now time to get out and have some fun! Classes have finished at LEOT for this semester and will not begin again until September, which is the normal Lao school year. 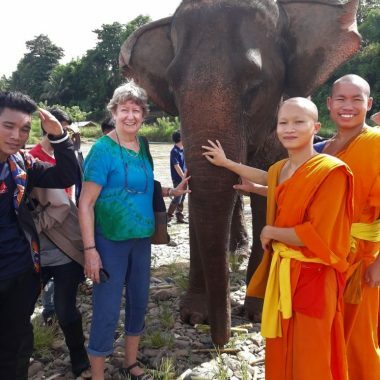 Now many of our students are enjoying field trips to various locations around Luang Prabang. Yesterday, a group of 30 students enjoyed an afternoon visit to see elephants at the Mandalao Elephant Sanctuary on the edge of town. Most of the students had only seen elephants from a far, so it was indeed wonderful giving them the opportunity to get close to the animals and be able to feed them and touch their skin. The staff at Mandalao were wonderful and very informative and a staff member talked in Lao and English, giving the students some important information about the elephants in Laos. The decline in elephant numbers is still continuing and the number of elephants in Laos is now below 1,000. It was a joy to see the faces and anticipation of the students as the elephants approached them and they fed them with bananas and sugar cane. I think they all managed to feel the rough skin of the elephant and some were even brave enough to give them a hug.